I love to run. I am by no means a competitive runner. I have won a couple of first places in my age division, but only because there were very few in my division in those races! 🙂 No, I run because I love the euphoria I feel after the training run or the race. I run because I want to stay in shape and live as long as I can to love my wife, children, grandchildren, and…great-grands? I run because I love the time alone, on the road, just me and my iPhone , listening to podcasts like the one I am going to tell you about, or a great sermon by Alistair Begg or John Piper, or music by Steven Curtis Chapman or James Taylor. 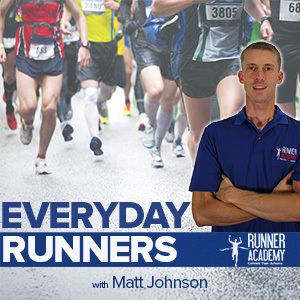 So, you may be an avid runner OR one of those people who say, in response to someone who says they are going for a run, “Is someone going to be chasing you?” Or, “Why in the world would anyone in his right mind WANT that kind of torture?” Either way, I encourage you to check out this podcast by Matt Johnson. It’s called Everyday Runners, and you can find it (and subscribe to it) here: http://runneracademy.com/everyday-runners-podcast/ I heard about it from my wife (who is also a runner) last week, and listened to 2 and 1/2 episodes while on a ten mile run last Saturday. And I LOVED it! In each episode of this brand new podcast, Matt interviews everyday runners like you and me, and you will hear amazing stories from people who started 100 lbs overweight and within a couple of years had run their first marathon. Matt is a running coach as well, and at the end of each episode he answers questions that runners have sent him. His answers are excellent! So….what are you waiting for? Start running! I hear you. No matter how you choose to listen, you will not be disappointed! Sounds interesting.. I’m not sure I can manage running without music, but maybe I will listen to it in my car.